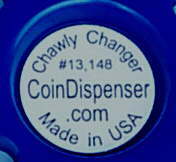 The Chawly Changer Coin Dispensers for your hand, pocket, purse, or car. NOTE: COINDISPENSER.COM is the official site of Chawly Products Company, and Chawly Products Company is the ultimate source of the Chawly Changer. Unique design lets you easily push coins out by their edges. Ruggedly made in the U. S. A., by its inventor! All of your coins edges can be seen for counting. Shaped like a broken-in wallet, only smaller. See details. Available in 7 colors. 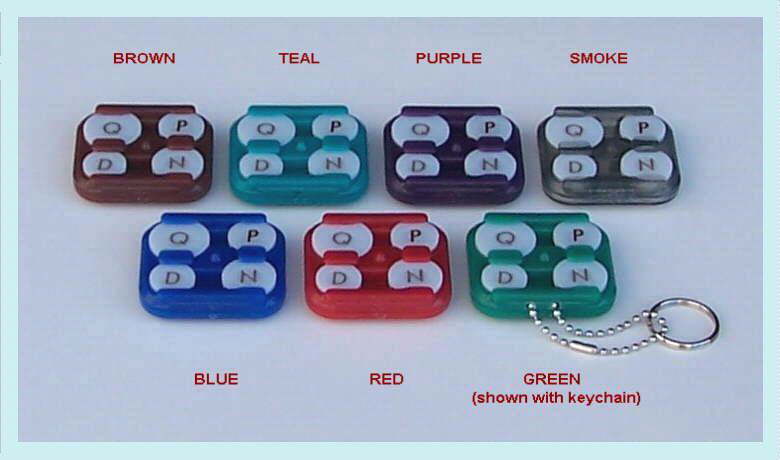 Each color dispenser can be ordered either with, or without an attached keychain. Silver for Quarters, Nickels & Dimes. Note: Dimes, pennies, and nickels can each be carried in the next larger cell, for when you have more of one coin, but less of another. 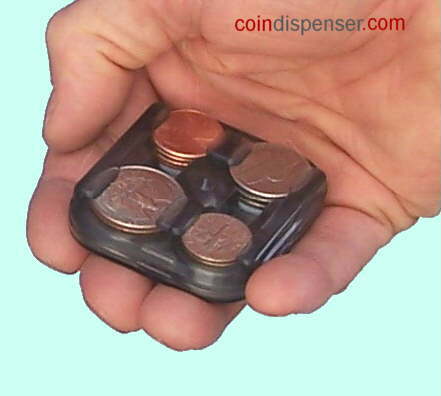 This means that the dispenser can hold 8 dimes, or 8 pennies, or 6 nickels while still carrying various other coins. A second Chawly Changer will double your coin capacity. for each dispenser with keychain. for postage & handling, for any size order. *All prices U. S. currency. This product only holds USA coins, and can only be shipped to destinations within the USA. A refund is guaranteed upon the product's return, if not satisfied. Due to an overwhelming surge in orders, wholesale and discount purchasing is no longer available. Maximum order is 20 changers per customer, per month. Chawly Products Company is Charlie Wolters, the inventor of the Chawly Changer, and his machinery.